It was a very cold and snowy drive up to Loch Lochy hostel on the Friday night with the worst part of the journey being from Spean Bridge to the hostel, well it is December after all. I wouldn’t actually know as Anne and I didn’t leave Edinburgh till Saturday morning but all of the accounts I heard told the same story. The main thing was that everybody arrived safe and sound and settled into the nearly empty hostel. It was a very cold night (outside that is, it was quite warm inside) and when Mike and Fiona set off with grand plans of doing Gairich, quite a sensible plan really as it would mean the knee deep bog on the approach would be frozen reducing it to merely shin deep instead, it wasn’t long before it became obvious this wasn’t perhaps the best plan after all as only a mile or so up the road from the hostel a car had skidded and was no longer on the road having made its acquaintance with a local ditch. Only a few miles further on another car had also left contact with the road and so Mike and Fiona wisely decided not to risk the Tomdoun road so opted for a couple of Grahams in the Great Glen instead. 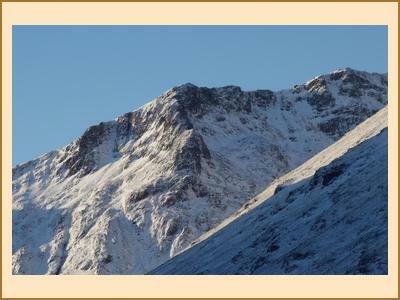 Meanwhile back at the hostel the majority of folk decided walking from straight from the door was the order of the day and this split into two parties (Ken, Perry, Chris R, David B, Duncan, Pauline, David and Kenny) on the munro of Sron a Coire Garbh and the Corbett Ben Tee. 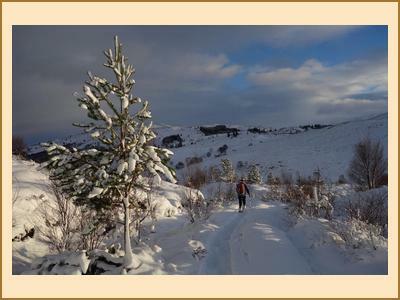 Both reported hard work trail breaking in the fresh snow and limited views on the summits. Chris A was Corbett bagging along the Glenfinnan road, an exploit which he would repeat the next day and the day after that. Anne and I broke trail through deep snow with long tussocky grass underneath, an absolute joy, on the munro top on Cruach Ardrain and like those further north got no view whatsoever. It was another very cold night, it was showing -9c as we drove past Spean Bridge and it turned into a beautiful blue sky day, the highlands at their very best. Perry, Ken, David B, Pauline and David headed towards the Kingshouse for an ascent of Beinn a Chruslaiste, Chris A returned along the Glenfinnan road for the Rois Bheinn group of hills, myself Anne, Mike, Fiona and Kenny opted for that old favourite the wee Buachaille while Chris R and Duncan headed to the mamores to do a round over Am Bodach. It was one of those days that it didn’t really matter what hills you were on you were guaranteed a stunning day, more of those please………….